Here are some kitchen hacks that I have learned or adopted over the years. This is far an all-inclusive list, but I don’t think it’s too shabby. If a recipe calls for half an onion, chop the entire onion. I use a mandolin-type slicer. It has 4 settings, two thin, two thick, slices or strips. It takes me all of 5 minutes to peel and slice the onion and run my knife across the strips for a quick dice. Then I store the leftover onion in a glass bowl (not a fan of storing in plastic). For “minced” garlic – use a garlic press. If a recipe calls for minced garlic and it’s just a small amount, it’s rather quick and no need to get out a knife and cutting board. Garlic smell on your hands? Pick up a metal soap. They are relatively inexpensive (around $6.00-$20.00). Simply wash your hands using the metal soap and in a few moments, the smell goes with it. Uniformity is key. A couple of years ago, I picked up a small cookie scoop. I bake a lot during the holidays, and this $7.00 gadget was a life-saver. Using the scoop made light work of rolling 4 dozen cookies. It grabs the same amount each time. There’s no wondering if you have too little or too much dough. Not to mention, everything will bake evenly if they are all the same size. I have even expanded using the scoop to making meatballs. Perfectly sized and shaped. Make your own hamburger patties. This was a trick I learned from my dad, way back when. We always bought Skippy peanut butter. If you get the large container, save the lid when the peanut butter is all gone. After you wash the lid, lay a piece of plastic wrap over it. Then fill will hamburger meat until it’s flush with the lid. Using the plastic wrap, lift out the patty. Perfectly shaped and portioned hamburgers. Not too thick and not too thin. Boil that chicken. This is a two for one deal. I like to boil chicken quarters for recipes such as enchiladas or casseroles. One of the best parts of shedding meat is it goes farther. Our family is only 3 people, so I can normally get two meals out of 4 chicken quarters. No instead of just boiling the chicken in water, let’s add a few things. I typically will quarter an onion, peel and smash 3-5 cloves of garlic (depending on their size), rough chop a few carrots and celery stalks. 10-15 whole peppercorn and add it all to the pot. Then add my chicken and finally the water. When the chicken is done, remove those and use how you intended. Now, remove all the vegetables and pour the stock in a non-metal bowl. Let cool to room temperature, then refrigerate overnight. Next morning, scrape off the fat. Pour into mason jars and freeze (leave room for expansion as it freezes). The other option is to can the stock, if you have a pressure canner (which I do). Learn to can. Canning is making a comeback. It’s not just for grandmas anymore. 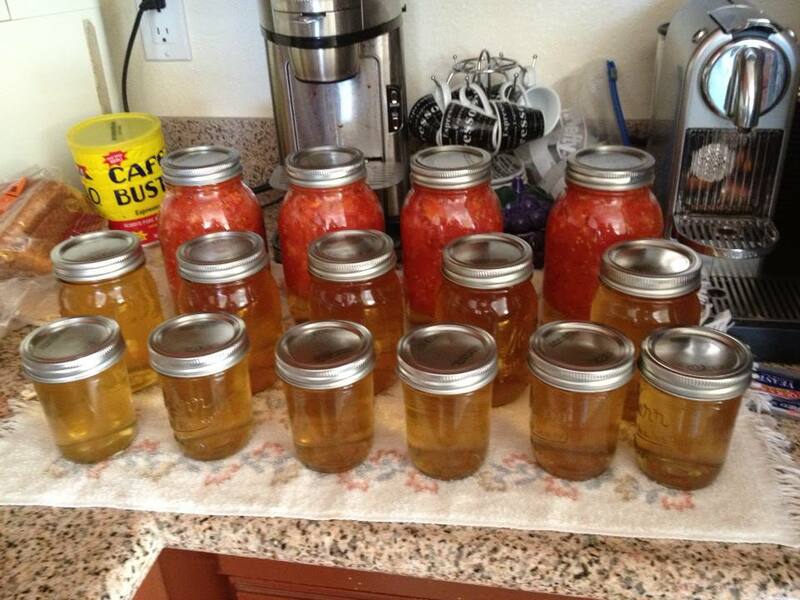 I started out waterbath canning. Those would be your high acidic foods. Tomato related recipes and fruit jams. Even if you can for this reason alone, you will feel better about what you are eating and can preserve some of the in-season produce to enjoy all year long. If you’re adventurous, then pickup a pressure canner. Remove the images of those exploding pressure cookers. These have come a long way. You’ll be able to preserve vegetables, make stocks, store food preservative free and low sodium. 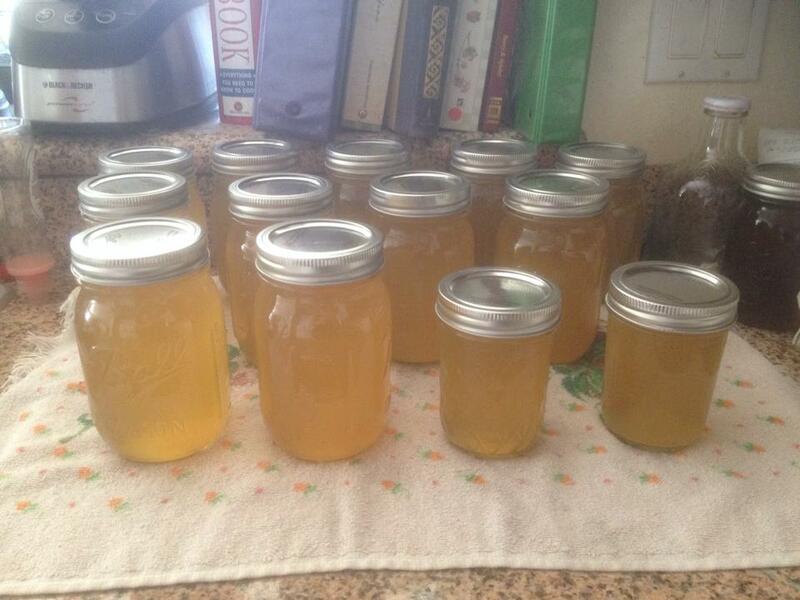 I personally can make 7 pints of vegetable stock for about $5.00, during the summer. Try buying 14 cups of vegetable stock for $5.00, you’ll never be able to. Left over Thanksgiving turkey. Some carrots, celery and onions (which you have from making the stuffing), can be turned in to turkey soup. When you’re ready to use it, either add some rice or pasta. Simple meals and perfect for the upcoming winter. I will say, canning isn’t the cheapest kitchen practice to get into, but there are deals to be had. I invest the time because of food allergies and wanting to eat better and with minimal preservatives. Mason jars are your friend. Sounds strange, but I LOVE my mason jars. My husband, he doesn’t share the same feelings. In addition to using mason jars with my canning, I use them to store liquids, take milk to work, freezing broth, holding pens, organizing crafting supplies, etc. There are these white, plastic lids you can buy. They fit on standard mouth jars. That means you can use the same lid on a 4 oz., half-pint, pint and quart jar. Now that’s versatility. Just because I have four dozen mason jars, at any given time, doesn’t mean I’m addicted to using them. Ok, in my case, it does. But that’s beside the point. Mason jars are extremely useful in so many ways. So there are my kitchen hacks. I hope you find them interesting, if not useful. I’m sure I’ll have another list of hacks for you soon. I’d love to hear some of your hacks, if you’d like to share.